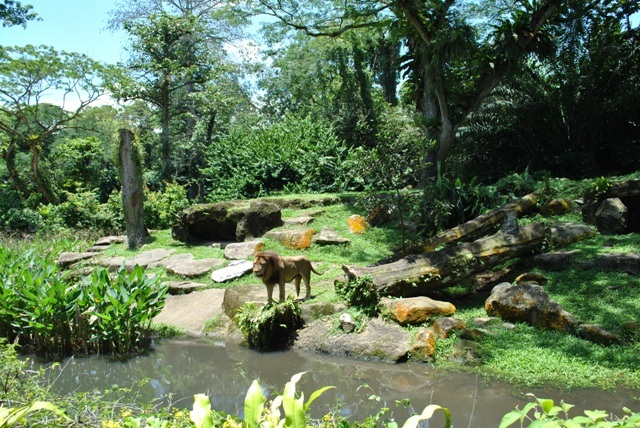 The animals live in a place where their natural habitat is simulated, and even the barriers used to separate them from the guests look natural – vegetation, streams, and rock walls. This design eliminates the need to enclose the animals in cages. Because the animals’ environment simulates their natural habitat, their natural behavior remains intact. There are 2,500 animals in the zoo representing 316 species, and 36% of these are considered threatened. When you enter the zoo, you will be taken into a unique tropical rainforest experience through the Rainforest Walk, a trail that leads you along a rainforest-inspired habitat. Here you will see various rainforest animals including the famous Orang Utan. Aside from the Rainforest, there are other habitats featured in Singapore Zoo. Among these are Australian Outback, Wild Africa, Hamadryas Baboons, Reptile Garden, White Tiger, and Elephants of Asia. The Australian Outback shows animals from different habitats in Australia. You will see the frill-necked lizard, the bearded dragon, the marsupial, and of course, the kangaroo. The Australian Outback was opened in 2006 with special guest Steve Irwin, the late Crocodile Hunter who died that same year. Steve Irwin contributed a lot in conceptualizing and designing the Australian Outback and even provided some of the animals for the zoo. Wild Africa features animals from the Dark Continent, such as the zebra, the cheetah, the giraffe, the white rhino, and the king of the jungle – the magnificent lion – in an Africa-like habitat. Hamadryas Baboons are shown in an 8,000-square meter area inspired by the Great Rift Valley of Ethiopia. This environment houses almost 90 hamadryas baboons. Other residents include black-backed jackals, Nubian ibexes, mongooses, and rock hyraxes. The Reptile Garden in Singapore Zoo is home to a number of interesting reptiles like the Komodo Dragon, the false gharials, the rhino iguana, and the Aldabra giant tortoise, the world’s second largest tortoise. White Tiger is spread over an area of 1,100 square meters and showcases beautiful Bengal tigers. The three tigers became part of the zoo in 2001 through an animal exchange program courtesy of Taman Safari of Indonesia. Elephants of Asia covers an area of 1 hectare that mimics the elephants’ natural Asian environment. The place comes complete with a bathing pool, a mud wallow, and even native thatched huts reminiscent of those found in Myanmar. Visitors are able to observe the animals by walking on elevated footpaths. Elephants of Asia also shows displays of how the largest mammal on earth has influenced Asian culture and history. Aside from its cleverly simulated habitats, Singapore Zoo is also famous for its efforts to conserve wildlife. In 2006, it opened its Wildlife Healthcare and Research Centre, which aims to rehabilitate wildlife and promote studies that will help in their conservation.